Shortly after the devastating Haiti Earthquake of January 12, 2010, I published this blog post on the urgent need for an SMS code of conduct for disaster response. Several months later, I co-authored this peer-reviewed study on the lessons learned from the unprecedented use of SMS following the Haiti Earth-quake. This week, at the Mobile World Congress (MWC 2013) in Barcelona, GSMA’s Disaster Response Program organized two panels on mobile technology for disaster response and used the event to launch an official SMS Code of Conduct for Disaster Response (PDF). GSMA members comprise nearly 800 mobile operators based in more than 220 countries. Thanks to Kyla Reid, Director for Disaster Response at GSMA, and to Souktel’s Jakob Korenblum, my calls for an SMS code of conduct were not ignored. The three of us spent a considerable amount of time in 2012 drafting and re-drafting a detailed set of principles to guide SMS use in disaster response. During this process, we benefited enormously from many experts on the mobile operators side and the humanitarian community; many of whom are at MWC 2013 for the launch of the guidelines. It is important to note that there have been a number of parallel efforts that our combined work has greatly benefited from. The Code of Conduct we launched this week does not seek to duplicate these important efforts but rather serves to inform GSMA members about the growing importance of SMS use for disaster response. We hope this will help catalyze a closer relationship between the world’s leading mobile operators and the international humanitarian community. Since the impetus for this week’s launch began in response to the Haiti Earth-quake, I was invited to reflect on the crisis mapping efforts I spearheaded at the time. (My slides for the second panel organized by GSMA are available here. My more personal reflections on the 3rd year anniversary of the earthquake are posted here). 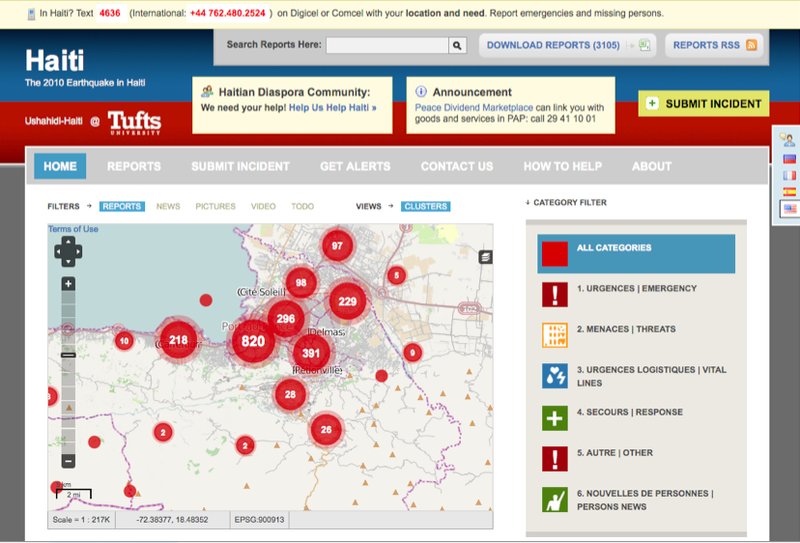 For several weeks, digital volunteers updated the Ushahidi-Haiti Crisis Map (pictured above) with new information gathered from hundreds of different sources. One of these information channels was SMS. 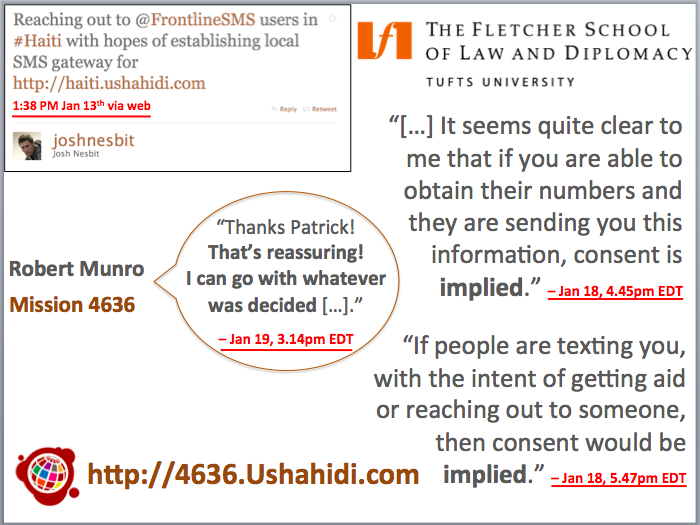 My colleague Josh Nesbit secured an SMS short code for Haiti thanks to a tweet he posted at 1:38pm on Jan 13th (top left in image below). 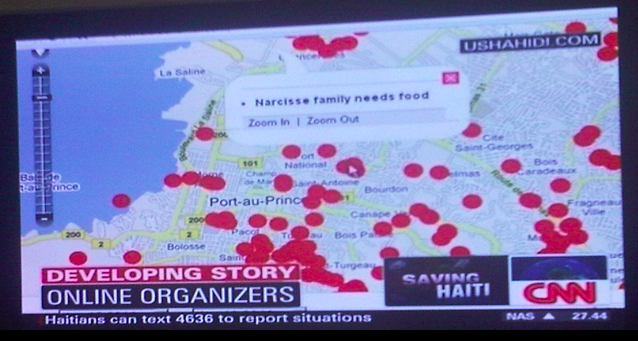 Several days later, the short code (4636) was integrated with the Ushahidi-Haiti Map. We received about 10,000 text messages from the disaster-affected population during the during the Search and Rescue phase. But we only mapped about 10% of these because we prioritized the most urgent and actionable messages. While mapping these messages, however, we had to address a critical issue: data privacy and protection. There’s an important trade-off here: the more open the data, the more widely useable that information is likely to be for professional disaster responders, local communities and the Diaspora—but goodbye privacy. Time was not a luxury we had; an an entire week had already passed since the earthquake. We were at the tail end of the search and rescue phase, which meant that literally every hour counted for potential survivors still trapped under the rubble. So we immediately reached out to 2 trusted lawyers in Boston, one of them a highly reputable Law Professor at The Fletcher School of Law and Diplomacy who also a specialist on Haiti. You can read the lawyers’ written email replies along with the day/time they were received on the right-hand side of the slide. Both lawyers opined that consent was implied vis-à-vis the publishing of personal identifying information. We shared this opinion with all team members and partners working with us. We then made a joint decision 24 hours later to move ahead and publish the full content of incoming messages. This decision was supported by an Advisory Board I put together comprised of humanitarian colleagues from the Harvard Humanitarian Initiative who agreed that the risks of making this info public were minimal vis-à-vis the principle of Do No Harm. Ushahidi thus launched a micro-tasking platform to crowdsource the translation efforts and hosted this on 4636.Ushahidi.com [link no longer live], which volunteers from the Diaspora used to translate the text messages. I was able to secure a small amount of funding in March 2010 to commission a fully independent evaluation of our combined efforts. The project was evaluated a year later by seasoned experts from Tulane University. The results were mixed. While the US Marine Corps publicly claimed to have saved hundreds of lives thanks to the map, it was very hard for the evaluators to corroborate this infor-mation during their short field visit to Port-au-Prince more than 12 months after the earthquake. Still, this evaluation remains the only professional, independent and rigorous assessment of Ushahidi and 4636 to date. The use of mobile technology for disaster response will continue to increase for years to come. Mobile operators and humanitarian organizations must therefore be pro-active in managing this increase demand by ensuring that the technology is used wisely. I, for one, never again want to spend 24+ precious hours debating whether or not urgent life-and-death text messages can or cannot be mapped because of uncertainties over data privacy and protection—24 hours during a Search and Rescue phase is almost certain to make the difference between life and death. More importantly, however, I am stunned that a bunch of volunteers with little experience in crisis response and no affiliation whatsoever to any established humanitarian organization were able to secure and use an official SMS short code within days of a major disaster. It is little surprise that we made mistakes. So a big thank you to Kyla and Jakob for their leadership and perseverance in drafting and launching GSMA’s official SMS Code of Conduct to make sure the same mistakes are not made again. While the document we’ve compiled does not solve every possible challenge con-ceivable, we hope it is seen as a first step towards a more informed and responsible use of SMS for disaster response. Rest assured that these guidelines are by no means written in stone. Please, if you have any feedback, kindly share them in the comments section below or privately via email. We are absolutely committed to making this a living document that can be updated. To connect this effort with the work that my CrisisComputing Team and I are doing at QCRI, our contact at Digicel during the Haiti response had given us the option of sending out a mass SMS broadcast to their 2 million subscribers to get the word out about 4636. (We had thus far used local community radio stations). But given that we were processing incoming SMS’s manually, there was no way we’d be able to handle the increased volume and velocity of incoming text messages following the SMS blast. So my team and I are exploring the use of advanced computing solutions to automatically parse and triage large volumes of text messages posted during disasters. The project, which currently uses Twitter, is described here in more detail. This entry was posted in Crisis Mapping, Crowdsourcing, Humanitarian Technologies and tagged #MWC, 2013, Code, Conduct, data, GSMA, Haiti, privacy, Protection, SMS. Bookmark the permalink. A lot has changed over the past couple of years. Scalable platforms can be expected to be reliable now. SMS interface can be as malleable as we like. Even whether SMS is handled by a cell operator or private device (Tether) is coming into question. The future must accept the ubiquity of SMS for the time being and leverage clever interactions over brute force of volunteers or concerns about scarcity of resources. Post-Disaster is a cooperative group in need of information yet still capable of providing the most expert local guidance. Following the call-and-response method of the Occupy movement, would have yielded you a pretty roughly categorized group of responses. With even a modicum of Operator support three different lines could have been provisioned to manage different levels of input. The value offered by citizen-directed message flow is so overwhelming in times of crisis, it is still mind blowing to me that the logical next step is not a de-facto reality. Emergency SMS needs to be free of cost. I sincerely hope that this GSM guideline is not only adopted but completely overwhelmed by cooperative efforts among industry and government to benefit the well being of the citizens to whom they both owe their existence. We can argue points about whether the state, commerce, or citizens should be driving the ship, but the basic interaction needs to be liberated, for everyone, worldwide. Every phone should be able to act as a mini EPIRB in this day and age.